The psychedelic rockers are officially the road warriors of the music kingdom. 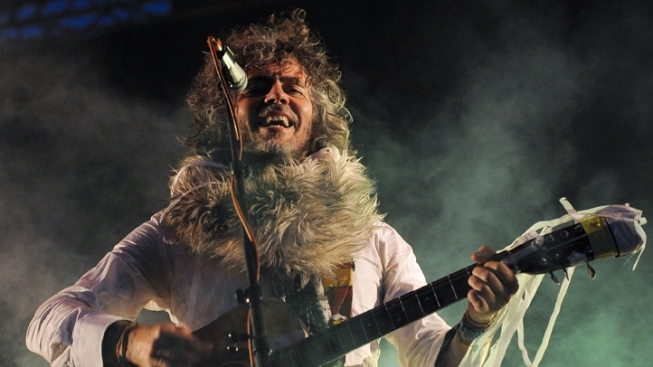 Wayne Coyne, the lead singer and guitarist of American band The Flaming Lips, during the Optimus Primavera Sound music festival in Porto, Portugal. It's official: The Flaming Lips are the music world's road warriors. The psychedelic rockers from Oklahoma set a new Guinness World Record for most live shows in a 24-hour period, finishing off their feat of eight performances Thursday night in New Orleans. Their journey started a day earlier in Memphis, Tenn., and they were joined on their trip south through the Mississippi Delta by several other acts and celebrities in celebration of MTV's O Music Awards. Jay-Z held the record previously at seven shows in 24 hours. Lips lead singer Wayne Coyne called the record "an absurd joy" in a news release. While the Lips were rocking, Selena Gomez, Big Freedia, Karmin, Adam Lambert, iamwhoiam and 30 Seconds to Mars picked up O Music Awards wins.